A Project Roadmap is a graphical high-level overview of the main components of the project: The timeline which includes the MMS (Major Mile Stones), key deliverable, dependencies, and goals. It is a simple viewing of the project, and shouldn’t contain many details which should appear only in the work plan. The roadmap PowerPoint template for software products has 4 sections – the timeline which is right on the top, capabilities, features and deliverable. The timeline on the top is a table and can be modified as needed. I have it down as monthly but you can change it to quarterly or yearly as needed. The capabilities part of the roadmap should capture the high-level goals the product or the project is intended to achieve. In the example above we are looking at building a decision management tool so the capabilities are Decision Metaphors, Workflow, and UI Module. The deliverable lists have the list of outcomes that you will expect from that phase of project or product development. After each capability, there is an indication line what will be the finished product. If your product is not usable till the end then you don't need the beta versions in between. Also, note that the color of the features matches with the capability to indicate which features belongs to which capability. Bigger the size of the feature the greater the importance of that features. In some cases, it might be important to develop a feature which is part of the capability planned for the later stage of the product development. In this article, we have also covered roadmap templates using excel, word and visio. In each of these templates, we have used an example IT Software Customization Project. With IT Projects it is common to show only the top level phases in the roadmap. As mentioned before project roadmap are used to show a high-level view of the projects so it is best to avoid having a lot of details in the roadmap. In the roadmap template work streams, a monthly timeline and the high-level tasks to be done. In this project, we have Current System Analysis, New Systems Build, Test and Go Live as different phases. Under the current system analysis tasks such as analysis, planning and presenting conclusions is included. In the New Systems Build, we have to approve the plan and doing the actual customization. In the testing workstream, we have testing and fixing defects. Finally, we have the system go live which is when the system will start running in production. Why should you use a project roadmap template? Sometimes it can be difficult for Product or Project Managers to visualize the different goals or a project or product development. 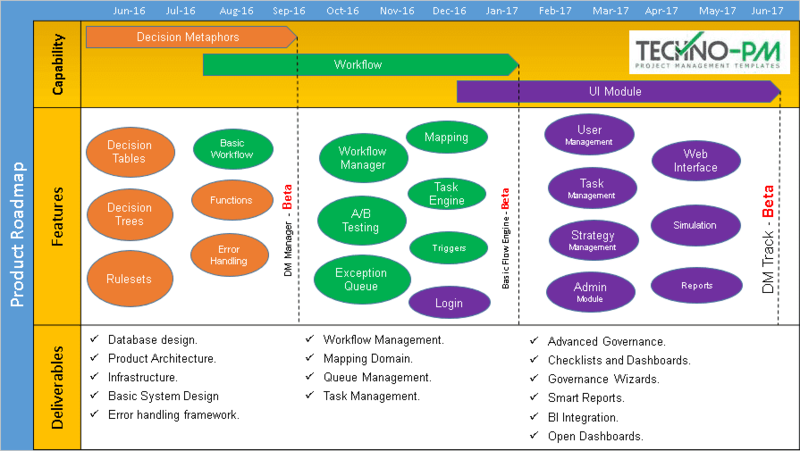 Using a roadmap template allows visualization of not only the timeline but also the components and the deliverable s with a high-level overarching strategy. 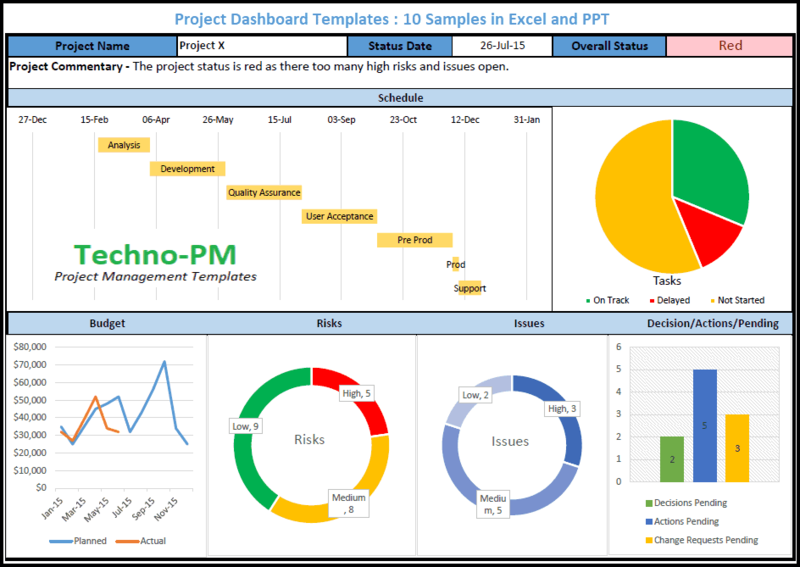 Project Roadmap can also show areas of high risk, in case the PM wishes to alert the team members to that fact. The main goal of the Roadmap is to show the team members and stakeholders of the project in one simple plan what the timeline is, and who is depending on them in order to begin/ complete their activities. The columns represent a time period (weeks, months, etc. ), while the rows represent the different Workstream that makes up a project. For example: In a SW project the rows can be split into Build, Testing, Data Migration, etc. Most roadmaps are color-coded, mainly by areas of responsibility. This means that each work streams has the same color. Each format has its own pros and cons, and everyone has their preferences. The most popular format is Excel since it is easy to put together and maintain. Depending on the duration of the project, decide on the time format of the columns. If the project takes more than 6 months, then each column should represent a month. If less, then a column should represent a week. In case of a monthly duration, the top tier should present the year and the one beneath it the months. If a weekly duration is chosen, then the top tier should be monthly and the bottom one weekly. Workstreams - Split the project into 4-6 main workstreams, and each one will be represented by one or more rows. They should be grouped by a similar group which is performing the tasks in the roadmap. Set the MMS, Deliverable, Tasks, and Dependencies. Now comes the part of inserting the parts that make up the roadmap. This can be achieved either by two methods – Top-Down and Bottom-up. Top-Down - Setting the due date for the projects’ end, and then working backward until reaching the start date. The result will be that the roadmap will present the duration available for each task if the project wants to meet the due dates. This is the easier method, but it doesn’t necessarily take in to account the input from the various work streams. The result may be that the team members won’t be aligned with the dates and duration, and not be committed to them. Bottom-Up - This method requires more time and effort, but the result is usually more accurate and the teams feel more committed to them since they are the ones who asked for them. Using this method entails gathering the estimated duration for the tasks from the teams, and inserting them into the roadmap. The dependencies should also be inserted, and this will make up the roadmap and the last task will set the due date for the entire project, Assigning a resource (optional): It is also possible to assign a certain resource to each task, and present their names in the roadmap. Communicate the roadmap: Share the result with all the team members, stakeholders, vendors and clients and receive their feedback. Once this is collected and analyzed, the final result must be shared with all of the project resources. It will serve as an alignment tool for the entire lifecycle of the project. Receive approval from the main stakeholders and marketing team to share the result. Decide on a method before starting the work on the roadmap (Top-Down vs. Bottom-Up). Remember that this is a team effort, and try and get as much input as possible while putting it together. This will result in a more mature and accurate roadmap, which will be highly accountable and be more likely to be achievable. 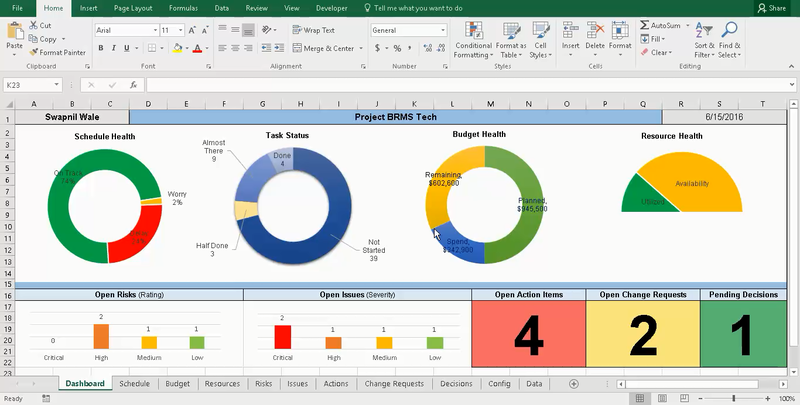 Visibility: Colour code the workstreams, make the MMS a different shape or colour than the regular tasks, clearly mark the dependencies and change the background colour of high-risk areas. Usually, a task is represented by a rectangle, and an MMS by a rhombus. If using a monthly duration, consider adding a third tier which will represent the weeks. This will help with identifying the correct start and finish dates of each task. Write the task / MMS name inside the shape, or by using a callout. 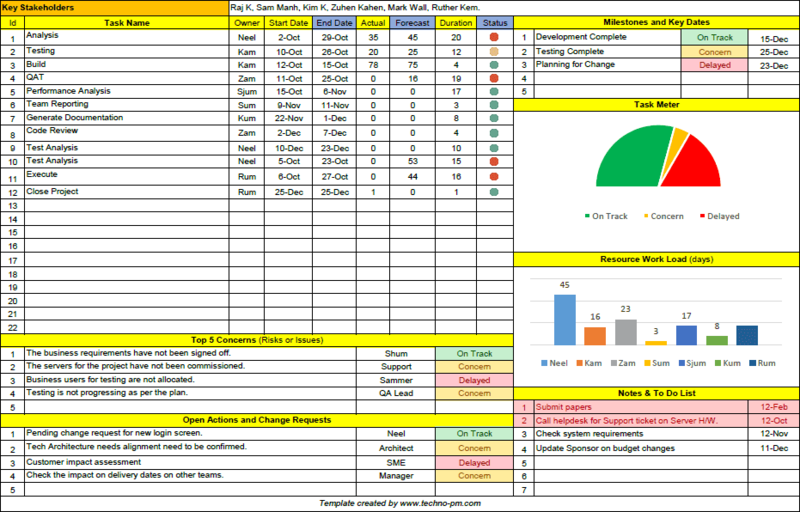 The roadmap can also be used for a progress vs. plan chart, by adding the percentage complete inside the shape itself. It is also possible to colour the inside of the shape according to the percent complete. This is a good visual way to easily show whether the progress is according to the plan. When presenting the roadmap in a status meeting, add a vertical line which starts at the top and goes all the way down to the bottom row. The line should be according to the current date when the status is presented (e.g. if the plan is presented on 21-Aug, the line should be in the fourth week of August and go all the way down). This will help in recognizing the late / ahead of schedule tasks. The roadmap should be the only tool used for presenting the high-level plan of the project, in order to negate confusion by using multiple plans. The roadmap should also be used to create a detailed plan. This should be done by breaking down the tasks into smaller ones, which together will compromise the larger roadmap task. The last row should contain only the Go-Live task.